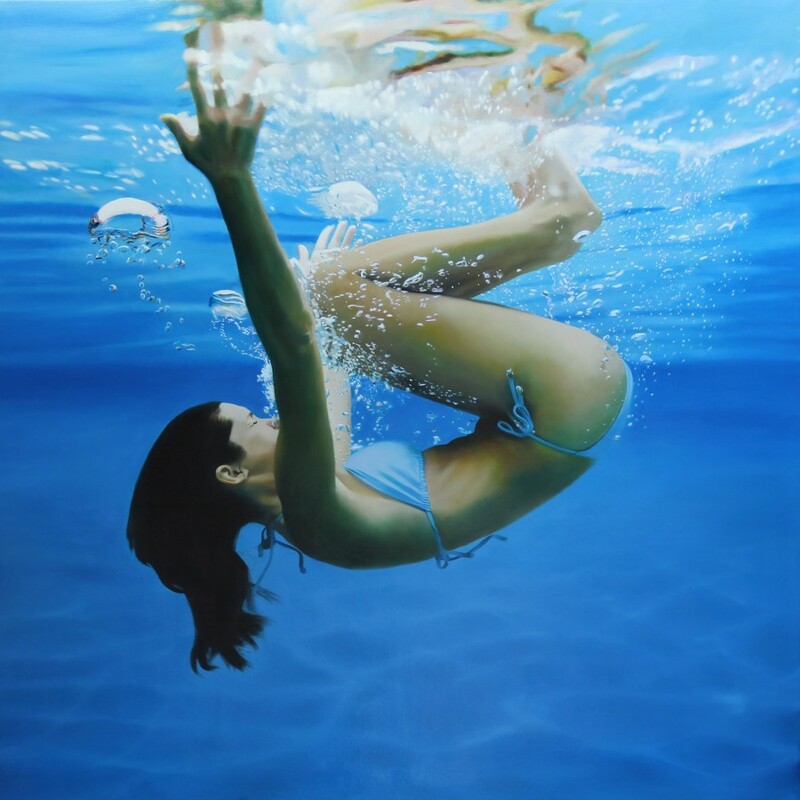 Plus One Gallery is pleased to present “Splash”, a summer group show of works by Toby Boothman, Matt Story, Gustavo Fernandes and Mike Francis. Dive into the water, and cool off. 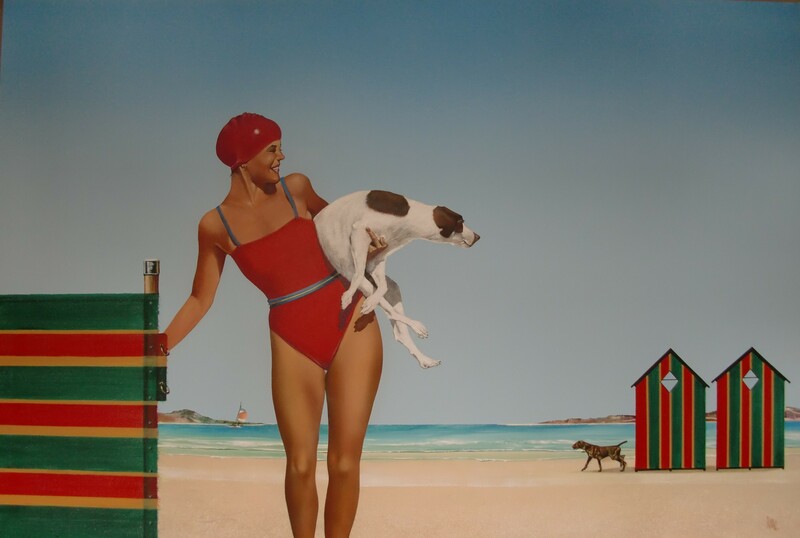 For decades, “splash” has been depicted by artists, photographers and filmmakers, not as the subject per se, but as the backdrop for narratives and storytelling which is often associated with glamour, voyeurism, summertime happiness or sadness. 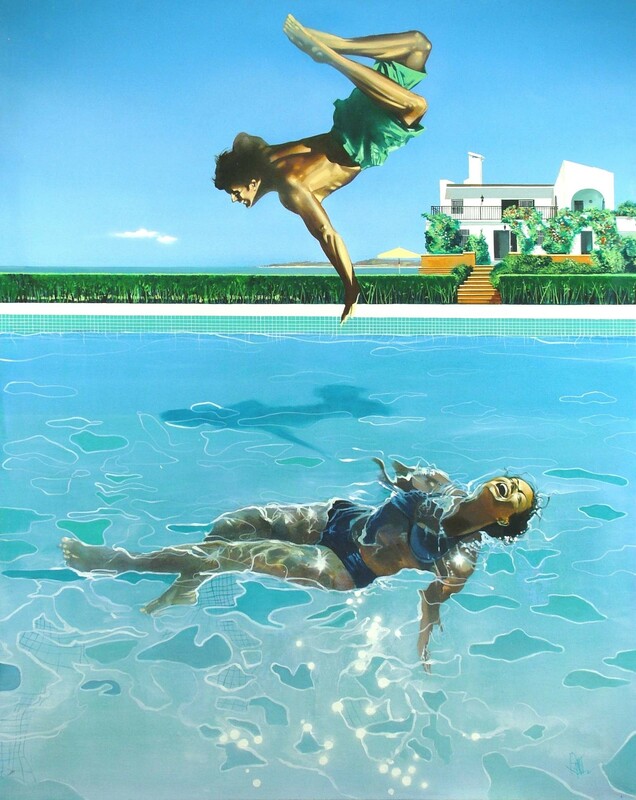 From the conflicting tranquillity and exuberance presented in David Hockney’s painting of swimming pools, to serving as the background for a series of poolside glamour photographs of Marilyn Monroe, and also the symbolic scene which suggests conspiracy in the film “La Piscine”. The pool, water and “splash” have been represented in a wide range of pop culture. In this group show, each artist at the Plus One Gallery group exhibition depicts the constant changing surface of the water through their own ways of expression. UK-born, South France-based Toby Boothman continued his oeuvre of human figures, glowing translucency and intensity and his epitaph with the white and raw amber colour in “White Hot”. Showing the mastery of Boothman’s technique-a modern version of a Renaissance painting technique named “Technique Mixed”, which layers detail under transparent glazes. The white heat penetrates through these layers, delivering a sense of intense sunlight by a manipulation of the white balance exposure. Each composition of Matt Story’s paintings uses gestures of figures to evoke platonic form and alludes to something that lasts beyond the moment. 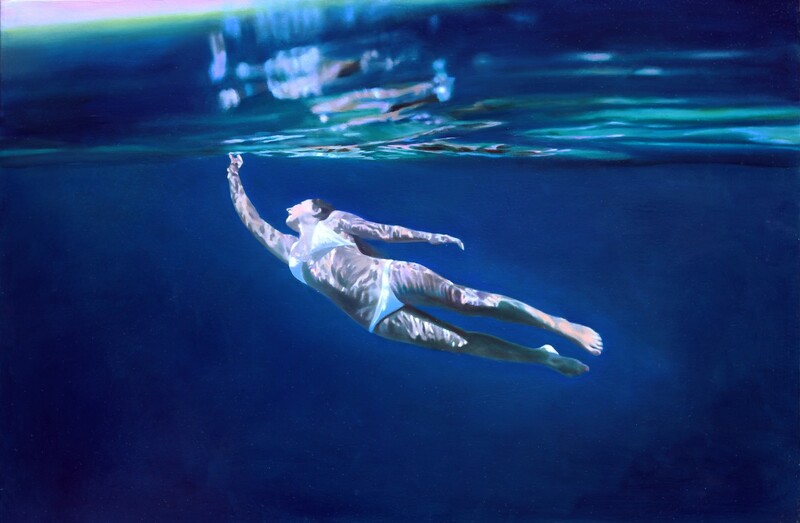 There is a distilled essence presented in the depiction of motion through Story’s paintings, which speak of innate self-reflection, with water being used as a metaphor for self-birth, baptism and cleansing. Story’s method of hyperrealist oil painting on canvas closely resembles the classical method, used for centuries by Titan and Caravaggio. He believes painting presents more than a camera can; we filter our interpretation of art through our memories which reside in us as invisible imprints. 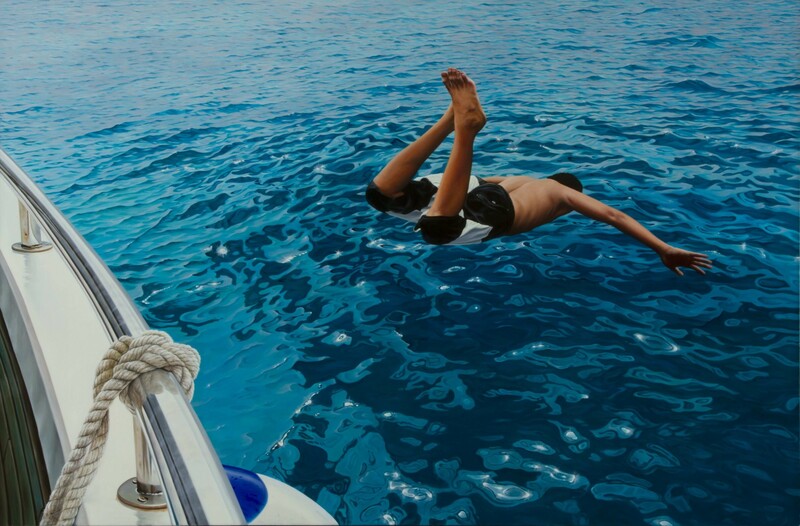 In contrast, Gustavo Fernandes “splashes” the viewer with his use of bold colour, rigorous techniques and strong and steady traces. Mike Francis presents his visual storytelling through his works which often blur the boundaries between the real and the imagined. Francis usually places characters against urban and natural backdrops to create a situational narrative, which tells a story. Francis worked as a commercial illustrator from the 50s to 70s. We can still trace this influence in his work, whereas his choice of colour, positioning of objects and everyday reality as subject matter mirrors his American counterpart Edward Hopper. 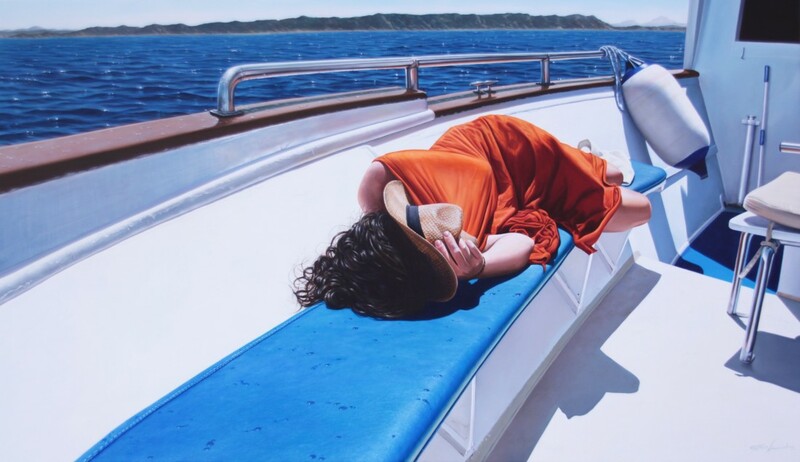 This collection of hyperrealist works depart from absolute reality, but evokes power from the created illusion of the real, the contradiction of motion and stillness, the sense of frozen moment and the transcending of time. A vibrant show for the last of summer, “splash” into the summer time glories, perhaps even the sweet sense of sadness.